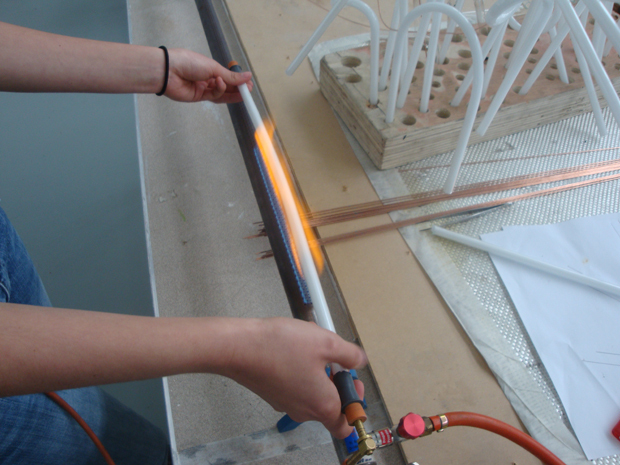 Glass tubes are bent after careful heating in the right angles, using gravity. Results like this only come after lots of practice. The ribbon burner has a long flame that softens a large part of the tube evenly. 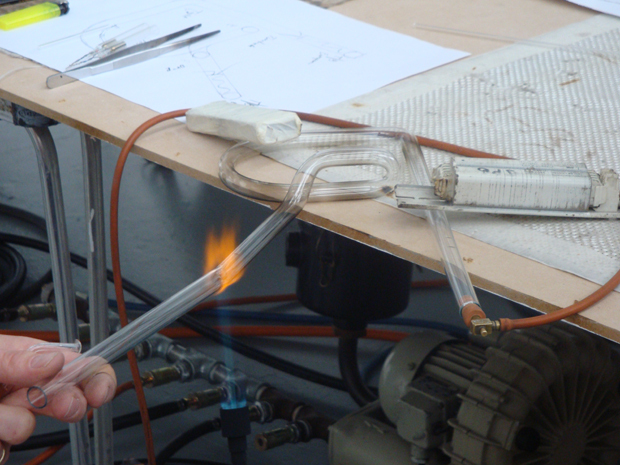 Joining two glass tubes using a precise burner was extremely difficult. I totally failed at my attempt, I ended up blowing a glass bubble instead because of too much air, and then the bubble burst. A tube with a hole can never be used for neon. Part of the giant machine that creates a vaccum in the tubes before filling it with the required gases. 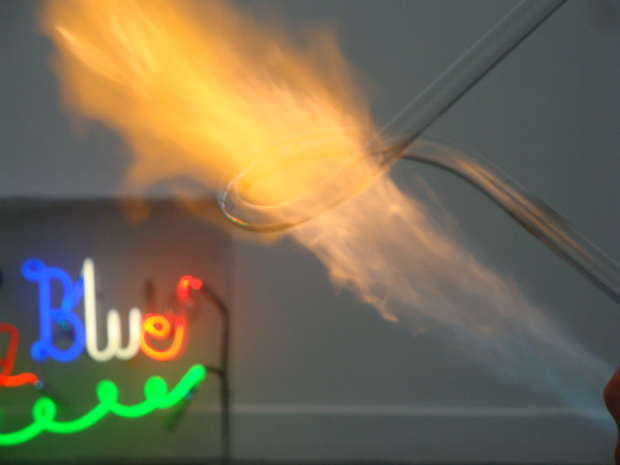 Neon master Julia Bickerstaff and British artist Richard Wheater encouraged us to question the limits of the material and explore its potential in relation to our individual art practice. That was the best part, being introduced to a completely new medium and told to freak out with it on the same day. 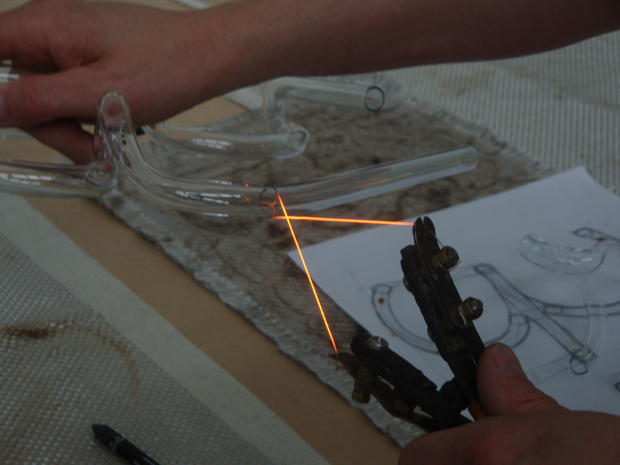 Also worth mentioning was how to transcribe an idea into a drawing for neon-making. The video below is my work (made by Julia of course) which we filled with helium. I love the colour of helium, its a natural pink hue that went well with the concept, which is the number sixty-nine in Devanagari letterforms. Due to a few impurities added in the tube flickers continuously, an effect that I really really wanted to try out. Another way to do this would be to programme it to flicker. However this is purely physical and does not need any external controls. The best work was displayed later at the Light Night festival in Bournemouth town center and the Neon: Shaping Light exhibition at the text+work gallery.